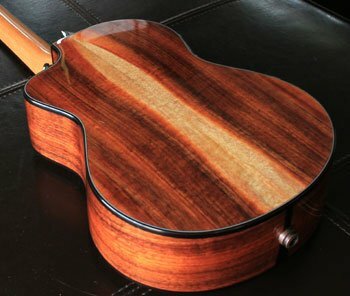 As the frets started to wear on my Kamaka, I began looking ahead to the future where a new ‘ukulele would quickly become a necessity. I didn’t want to upgrade. Truth be told, I thought (and still think) my Kamaka is one of the finest-sounding ‘ukuleles I’ve heard. I wasn’t excited about giving that up. But since none of the local super-luthiers liked the idea of doing a re-fret, I was pretty much out of luck. Chuck Moore and I have been friends since probably 2007 when we met at the Kahumoku ‘Ohana Workshop in Pahala. We’ve been each other’s biggest fans ever since and stay in pretty steady contact via email. For those who don’t know, Chuck is the creator of Moore Bettah ‘Ukuleles. He’s rightfully regarded as one of the best. Take a peek around his website and you’ll see why. For many years it never seemed right to ask Chuck to build for me. Though I think he always wanted to make me a uke and I certainly always wanted to play one of his, we danced around the subject for a lot of years. He finally said I had to be at least 21 before he’d consider building for me. His reasoning: spending that much money is a big decision for a young person. 21 came and I finally felt it was time to ask. A couple emails later and I was at the shop picking out the wood and features for my uke. That first day he crafted the beginning of the soundbox. We chose some fabulous sapwood koa with a white streak down the side for the back of the ‘ukulele. Butterflied together, it looks like an elongated oval popping out of the instrument. The sides were from the same piece, but without any special markings. 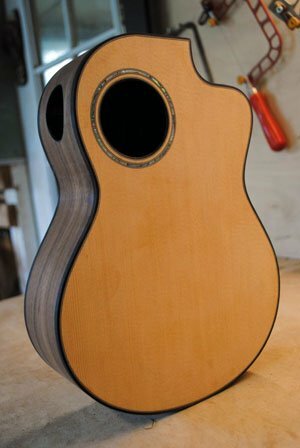 I think Chuck started out with a bearclaw spruce top, but as he put the back and sides together and held all the pieces he was restless. Something wasn’t right and I had no idea what it was. Everything looked great to me! After holding the bearclaw board for a while and pondering it, he disappeared into his cabinet of uke sets and returned with a different top. He put it together with the koa and said “Yes. That’s better!” This new top was the most tightly straight-grained spruce I had ever seen; even then the board had a fabulous ring to it when tapped. Somehow he knew that that piece of wood was the right match. One of Chuck’s coveted progress shots. Except for a couple pictures, that was the last I saw of the process. 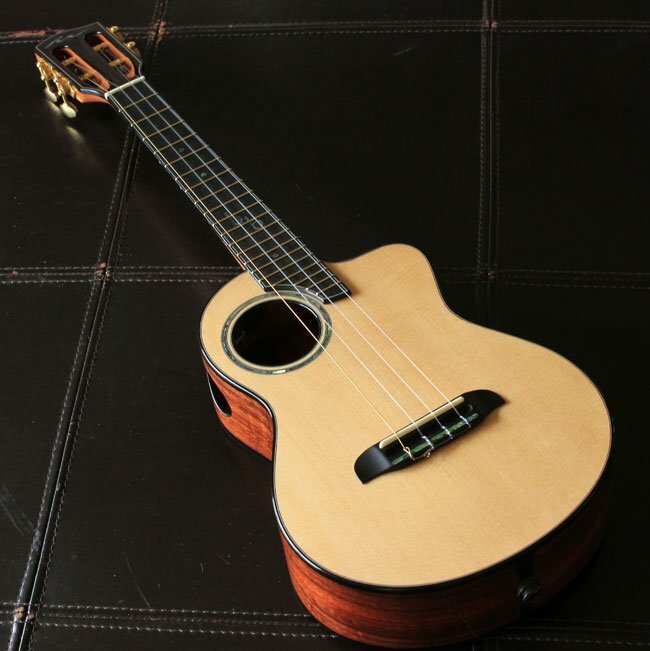 From all my previous shop visits I knew exactly what would be going into the ‘ukulele from start to finish, but the uncertainty of the outcome when I knew this uke was going to be mine to keep made for a very long wait. Chuck emailed me out of the blue one day. He asked if I could drive down to make a couple last minute decisions on the build. I made the trek as soon as I could and, of course, there were no more decisions to make. Chuck took me into the storeroom and handed me a uke. “What do you think of this?” It took me a moment to realize that in my hands was my new instrument. It was stunning. The finish was mirror bright and all the details were as precisely honed as you could expect from such a master craftsman. Playing it for the first time was a mixed bag. Of course, it felt amazing in my hands and was a dream to create music on, but the sound was bright. Really bright. My first thought was, “I can’t play this!” How wrong I was. I had to get used to the tone and, more than anything, the instrument had to mature. So I took it home and threw some Savarez Alliance strings on it to mellow out the tone. They helped a lot by emphasizing the weak lows and midrange, but weren’t ideal. They didn’t intonate or play quite as well as my trusty Worth clears. I rocked those strings for probably close to a year, by which point the ‘ukulele had opened up a lot. Flash forward four years and Chuck’s ‘ukulele has the most honey-sweet tone you could ask for. It has a perfectly balanced articulation and warm attack that has became part of “my sound” over the years. My custom Moore Bettah turns a lot of heads. Not just because it is a fantastically crafted, high-quality instrument, but because of its unconventional look. 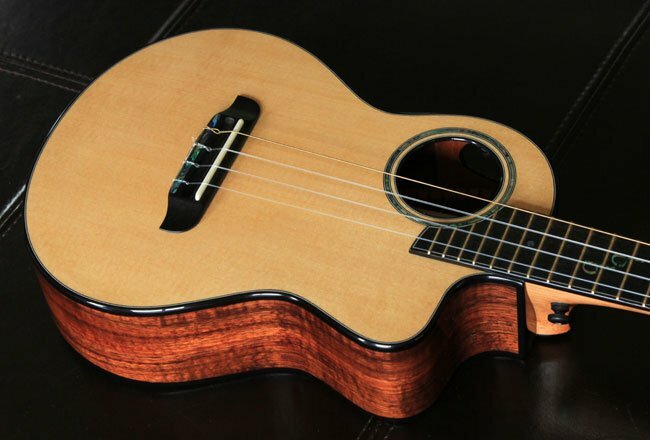 Binding the top and koa back and sides, is an ebony band around the top and bottom edges of the ukulele. It’s decorated with a white strip and helps protect the edges from the ruggedness of the world. A gentle cutaway gives me access to higher notes and adds a striking finishing touch to the sound box. The fretboard is ebony, bound in a simple fashion – again with white. 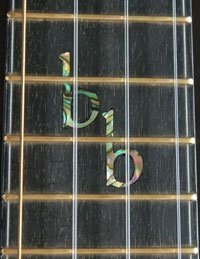 On it are the initials that are the highlight of most custom builds, I think; BB is inlaid with abalone on the 12th fret. The slotted headstock makes for fiddly string changes, but is worth it in every way. All the machine heads turn the same direction for tightening and loosening the strings, unlike a standard headstock where two of the pairs are reversed. Having the tuning pegs pointed backwards makes them 1 million times easier to access and keeps the look of the headstock clean. Tuning on the fly in the middle of the song is no longer an act of contortion. An L.R. 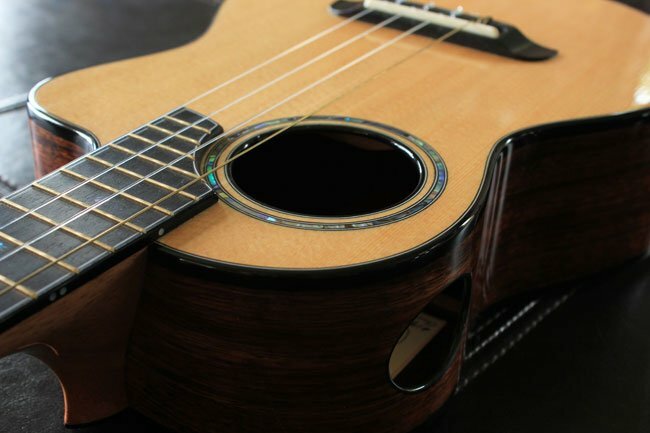 Baggs Five-0 pickup lends itself to the cause, making for, without a doubt, the best plugged in ‘ukulele sound that I’ve ever had my fingers on. The 3V watch battery is very light and provides adequate power to process the signal. I do wish that there was a 9V version just so that you could have a little more headroom on stage. The pick up jack holds one end of a strap and a small button on the bottom of the neck heel serves the other side. I’m not big on UAS. When you have something good – keep it and use it. Simple as that. Ever since I got my custom Moore Bettah from Chuck I knew that it would be with me until either the uke or I gave up the ghost. I still play other instruments. A new Outdoor Ukulele has become my car uke, my Kamaka still finds its way to practices and onto recordings. I use a Pono solidbody baritone in my rock/hip-hop band and still shoot videos for fun with a Tiny Tenor from my friend Pepe Romero. These instruments all have their place, but I feel a little lonely on stage without Chuck’s uke. This chapter isn’t done yet. Maybe in 10 years when the frets wear out I’ll have to give this post an update, but until then, I’m a spoiled and happy camper.